Barthel Beham established himself in Munich where he is documented from 1527. There he focused on portraiture although he also produced religious compositions. He received commissions from William IV, from Louis, 10th Duke of Bavaria and from patrician families in Munich. Beham died in Italy, probably in Bologna, during a study trip. 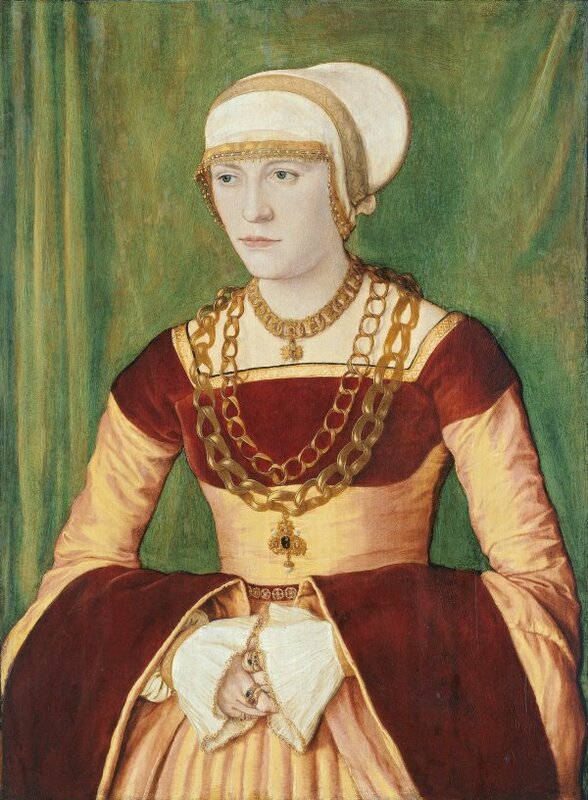 Aside from any portraits that he may have executed in Nuremberg, which are the subject of scholarly debate, one of the artist’s first clients in Munich was Leonard von Eck, whose portrait of 1527 is in the Metropolitan Museum, New York. This is followed chronologically by a pair in the Nationalgalerie in Oslo of 1528, and the present pair. In these two panels Beham depicts a married couple in the traditional format with the man on the left and the woman on the right. They are standing and more than half-length, which is a novel presentation at this period. They have different backgrounds: a blue tone that may be the sky with part of a green curtain in the case of the man, and the rest of the curtain for the woman, covering all the background behind her. This background reflects a change in the presentation of his models as Beham generally depicted them against intense tones, on occasions modelled by the light. The two figures have been identified through the coat-of-arms on the man’s ring on his index finger, which has two chevrons in red. This is the emblem of the patrician Stüpf family from Munich but scholars are, however, in disagreement as to whether these two sitters are definitely Ruprecht Stüpf and his wife Ursula Rudolph as there is little concrete proof to demonstrate this idea. Beham presents his sitters in elegant, costly clothes while the woman wears sumptuous jewellery. In addition to his use of the backgrounds he also played with the insertion of the figures into the spatial setting. While the panels are identical in size, Ruprecht Stüpf occupies almost the entire width of the composition, attracting our attention through the broad fur collar that he holds with one hand, while the fingers of his other hand seem to rest of the lower edge of the panel. His wife, who was also a member of one of Munich’s leading families, is presented with an emphasis on the horizontal. There is another portrait of Ruprecht Stüpf by Hans Mielich in which the sitter, now elderly, is presented in a similar fashion, wearing the same ring that enabled him to be identified as a member of the Stüpf family.